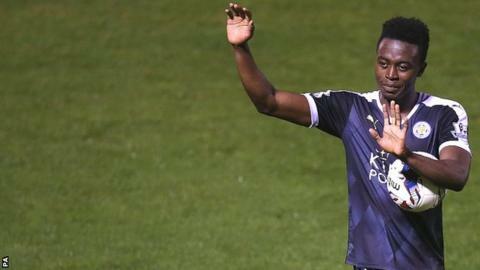 Leicester City striker Joe Dodoo has the focus and talent to become a "very good player", according to his manager Claudio Ranieri. Dodoo, 20, is set to play in the League Cup third-round tie at home to West Ham on Tuesday, having scored a hat-trick in the previous round against Bury. "He is a young player who is very concentrated on his job," told BBC Radio Leicester. "I have spoken a lot with him and he has a very good future." England Under-19 international Dodoo made his Premier League debut as a substitute in the draw with Bournemouth at the end of August and Ranieri has been impressed with what he has seen. The Italian added: "He is fast and when he shoots at goal, 80 or 90% he scores or hits the goal, and that is good. "He is ambitious and is a very quiet boy. He is still learning of course, but he can play as a striker or on the flank. For him it is important to get experience."